Aim: To evaluate the surface alterations seen in four kinds of Nickel-Titanium (Ni-Ti) instruments using a scanning electron microscope (SEM) for five successive uses in preparing root canals of extracted human molars and also to determine whether the design of the instrument influenced the appearance of defects on the instrument surface. Materials and Methods: Four different types of instruments namely; ProFile, ProTaper Rotary, ProTaper Hand and K3 Endo were used in 300 mesio-buccal canals. The instruments were examined under the SEM, after every use, to assess the progress of changes on their surfaces for a maximum of five uses. Statistical analysis used: Chi-square test. Results: The most prevalent defects observed were pitting, followed by metal strips. Signs of discontinuity, microfractures and disruption of cutting edge were also evident. Number of defects increased with successive uses. Conclusions: ProTaper Hand showed significantly more microfractures and metal strips than other instruments from third use onwards. ProTaper Rotary and K3 Endo also showed significant changes. The major clinical concern with the use of rotary Ni-Ti instruments is the unexpected fracture that occurs without any visible defects of previous permanent deformation. Although many studies have reported on the efficiency of Ni-Ti while shaping canal walls using different experimental models; , an assessment of the surface quality of the cutting surfaces and cutting heads after repeated use is necessary to give an insight as to the series of changes that occur in an instrument before its ultimate failure, thus helping us standardize the usage limit of an instrument. 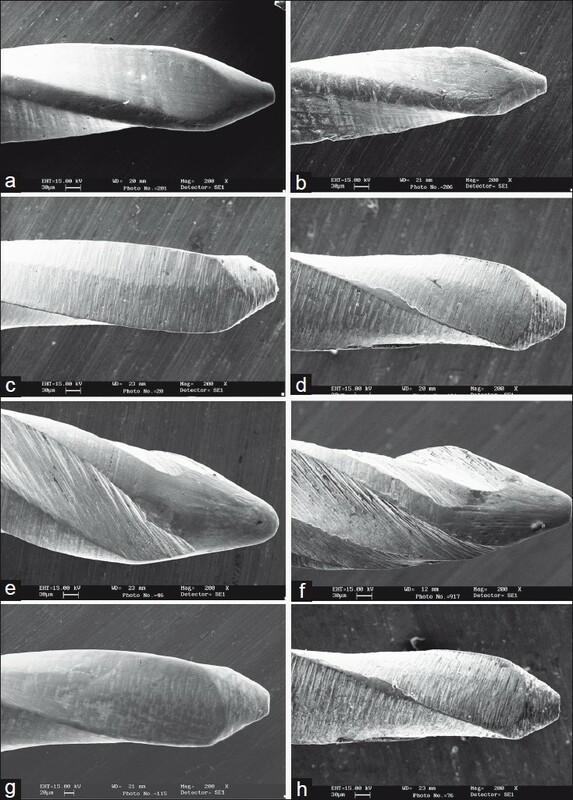 The aim of this study was to examine the tip, blades and surfaces of four kinds of Ni-Ti instruments viz. ProFile, ProTaper Rotary, ProTaper Hand and K3 for changes, in a SEM, before and after each use in preparing root canals of extracted human molars and also to determine whether the design of the instrument influenced the appearance of defects on the instrument surface. Fifteen files each of 0.04 taper #25 ProFiles (Dentsply International Inc. Tulsa) and K3Endo (Sybron Endo, Orange, CA) files and F2 Hand and Rotary ProTaper (Dentsply Maillefer, Switzerland) files were assessed in this study. The teeth were then randomly assigned into four groups viz. Groups I through IV with seventy-five teeth in each group. While grouping the teeth, it was made sure that the average angle of curvature of the mesiobuccal canals was same in each group (32.5°±0.5°). After a suitable glide path was created, these canals were instrumented following crown-down technique with rotary instruments following manufacturers' instructions [Table 1]. During the preparation, RC Prep (Premier Dental Products) was used as the lubricant and canals were repeatedly irrigated with normal saline. All canals were prepared by the same operator to avoid interpersonnel errors. Fifteen files each of 0.04 taper #25 ProFiles, 0.04 taper K3Endo, F2 Rotary ProTaper and F2 Hand ProTaper were examined for progressive changes on surface with use. Each instrument was used in five canals and observed under the SEM (LEO-435VP) before and after every use to assess changes on the instrument surface with progressive usage for a maximum of five uses. Thus in each group, 75 mesiobuccal canals were instrumented (15 files×5 canals each). However, any instrument that fractured or showed distortion during use was discarded and not considered for subsequent uses. Photomicrographs of the instruments were evaluated by one person and were observed at ×50 for gross changes, ×200 for blade and tip changes, ×520 for blade and surface changes and ×1000 for surface and tip changes [Figure 1]a, b, c and d. The number of instruments with defects on the instrument surface and the type of defects were noted. The data were tabulated and analyzed using Chi-square test with P-value set at 0.05. Chi-square test was used for statistical analysis of the results with P value set at 0.05. ProTaper Hand files showed significantly more disruption of the cutting edge after the first use as compared to other instruments. Both, ProTaper Hand and ProTaper Rotary files, showed significantly more microfractures after the third and fourth uses. The presence of microfractures in ProTaper Hand was highly significant, compared to the other groups, after the fifth use. Metal strips after the third use were again highly significant in ProTaper Hand in which all the instruments showed these changes. Therefore, metal strips were highly significant for these files in all subsequent uses. The metal strips in K3 Endo file were highly significantly more than ProFiles and ProTaper Rotary after the fourth and fifth uses. manner. ,,,, However all the studies evaluated changes on only one type of instrument and did not compare the progress of changes on different Ni-Ti instruments under similar conditions of use. Despite increased costs, Ni-Ti files are becoming increasingly popular. Consequently, clinicians should be aware of the wear and tear on the cutting surfaces of Ni-Ti instruments particularly on those used in rotary techniques. This may warn the operator of the likelihood of fracture. In this study, the changes on the instrument surface after preparing each canal were evaluated. Manufacturers of rotary systems recommend the application of a lubricant to the rotary files while shaping the canal system. A recent study revealed that the application of RC Prep as a lubricant while preparing curved canals, as compared to saline, consistently decreased the areas of stress on simulated root canals. In case sodium hypochlorite is used, there is a chance of pitting corrosion.­  In another study, a statistically significant amount of titanium was detected in solution when Lightspeed Ni-Ti instruments were dipped in 1% and 5% sodium hypochlorite for 30 to 60 minutes. Even though this corrosion might be considered irrelevant in a clinical scenario as it is unlikely for an instrument to have such a prolonged in situ contact duration, we have avoided the use of sodium hypochlorite to nullify any margin of error that could occur due to misinterpretation of changes produced by it under the SEM. Hence, the lubricant and irrigant of choice used in this study, to simulate the clinical scenario, were RC Prep and normal saline respectively. 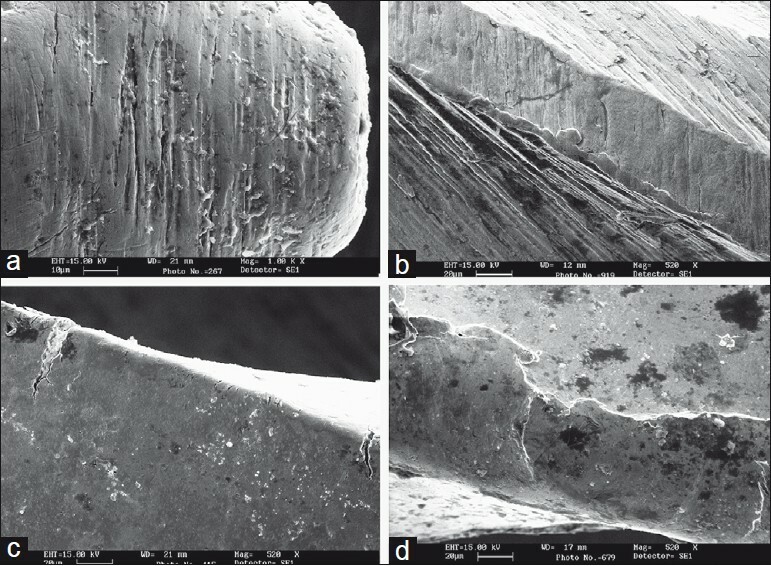 The SEM evaluation revealed that instruments showed the presence of defects such as pitting, strips, microfractures and disruption of cutting edge with usage. The frequency of occurance of these defects was found to increase with usage. Pitting, followed by metal strips were found to be the most prevalent defects. Similar results were found in a study by Tripi et al, (2001) who found an increase in pitting and scraping in Greater Taper Rotary instruments during usage. Rapisarada et al, (2001), while comparing ion implanted and non-ion implanted ProFile 0.04 #25 rotary instruments after use, observed that the non-ion implanted control instruments showed signs of early wear, pitting, strips, microfractures and disruption of cutting edge. Eggert et al, (2001) demonstrated the presence of debris, pitting and metal strips in the pre- and post-usage micrographs of Lightspeed instruments. However, they found a decrease in pitting during usage under the SEM. They explained this by the fact that, the pits were filled by debris during canal preparation and thus were no longer visible after sputtering. K3 Endo files presented with highly significantly more metal strips than ProFiles and ProTaper Rotary after the fourth and fifth uses. The K3 files are marketed as positive rake angle files with radial land relief and an asymmetrical cross-section. Stresses acting on an instrument will vary with its design, method of use and its size relative to the canal. , The positive rake angle and asymmetrical design of the K3 Endo files may probably have a role in contributing towards more metal strips. Further research into design and stress correlations is advocated to achieve more conclusive evidence on this subject. ProTaper Hand showed significantly more microfractures and metal strips than other instruments from third use onwards. 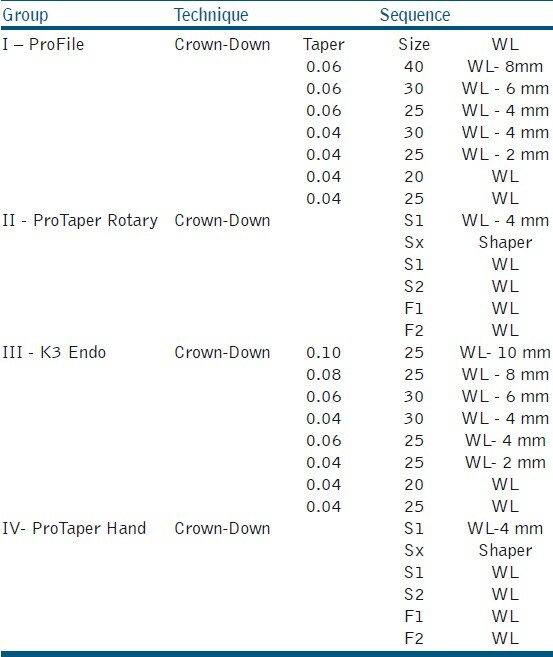 ProTaper Rotary and K3 Endo also showed significant changes. Though the question of usability of Ni-Ti files has been only partly answered, it can be said that there is a definite correlation between material fatigue, surface changes and fracture of these instruments with successive uses. Perhaps a correlation of surface changes and internal stresses produced in Ni-Ti instruments due to work hardening during usage might provide more insight into our understanding of the clinical event of fracture in these instruments. We wish to thank Mr. Rajesh Pathania, SEM Department, AIIMS, Delhi, for helping with SEM study; Mr. Bob Gannon, Sybron Endo for providing valuable information on K3 Endo and Mr. Shailnderan for helping with statistical analysis. 2. Walia HM, Brantley WA, Gerstein H. An initial investigation of the bending and torsional properties of Nitinol root canal files. J Endod 1988;14:346-51. 3. Thompson SA. An overview of nickel-titanium alloys used in dentistry. Int Endod J 2000;33:297-310. 4. Thompson SA, Dummer PMH. Shaping ability of ProFile.04 Taper Series 29 rotary nickel-titanium instruments in simulated root canals. Part 1. Int Endod J 1997;30:1-7. 5. Ankrum MT, Hartwell GR, Truitt JE. K3 Endo, Protaper, and Profile systems: Breakage and distortion in severely curved roots of molars. J Endod 2004;30:234-37. 6. Barnett F, Serota KS. The next level of nickel titanium root canal preparation: Sybron Endo K3 TM instrumentation. Oral Health 2002:37-44. 7. Zuolo ML, Walton RE. Instrument deterioration with usage: Nickel- titanium versus stainless steel. Quintessence Int 1997;28:397-402. 8. Sattapan B, Palamara JEA, Messer HH. Torque during canal instrumentation using rotary nickel-titanium files. J Endod 2000;26:156-60. 9. Eggert C, Peters O, Barbakow F. Wear of nickel titanium Lightspeed instruments evaluated by scanning electron microscopy. J Endod 1999;25:494-97. 10. Peters OA, Peters CI, Schonenberger K, Barbakow F. ProTaper rotary root canal preparation: assessment of torque and force in relation to canal anatomy. Int Endod J 2003;36:93-99. 11. Kuhn G, Tavernier B, Jordan L. Influence of structure on nickel titanium endodontic instruments failure. J Endod 2001;27:516-20. 12. Tripi TR, Bonaccorso A, Tripi V, Condorelli GG, Rapisarda E. Defects in GT Rotary instruments after use: An SEM study. J Endod 2001;27:78285. 13. Rapisarda E, Bonaccorso A, Tripi TR, Condorelli GG, Torrisi L. Wear of nickel titanium endodontic instruments evaluated by scanning electron microscopy: Effect of ion implantation. J Endod 2001;27:588-92. 14. Svec TA, Powers JM. The deterioration of rotary nickel titanium files under controlled conditions. J Endod 2002;28:105-07. 15. Tygesen YA, Steiman HR, Ciavarro C. Comparison of distortion and separation utilizing Profile and Pow-R Nickel-titanium Rotary files. J Endod 2001;27:762-64. 16. Sattapan B, Nervo GJ, Palamara JEA, Messer HH. Defects in rotary nickel-titanium files after clinical use. J Endod 2000;26:161-65. 17. Pettiette MT, Metzger Z, Phillip SC, Trope M. Endodontic complications of root canal therapy performed by dental students with stainless steel K-Files and nickel-titanium hand files. J Endod 1999;25:230-34. 18. Alapati SB, Brantley WA, Svec TA, Powers JM, Nusstein JM, Daehn GS. SEM observations of nickel-titanium rotary endodontic instruments that fractured during clinical use. J Endod 2005;31:40-43. 19. Shen Y, Cheung GS, Bian Z, Peng B. Comparison of defects in Profile and Protaper systems after clinical use. J Endod 2006;32:61-65. 20. Shen Y, Haapasalo M, Cheung GS, Peng B. Defects in nickel-titanium instruments after clinical use. Part 1: Relationship between observed imperfections and factors leading to such defects in a cohort study. J Endod 2009;35:129-32. 21. Anderson DN, Joyce AP, Roberts S, Runner R. A comparative photoelastic stress analysis of internal root stresses between RC Prep and saline when applied to ProFile/GT rotary instrumentation system. J Endod 2006;32:222-24. 22. Busslinger A, Sener B, Barbakow F. Effects of sodium hypochlorite on nickel-titanium Lightspeed instruments. Int Endod J 1998;31:290-94. 23. Peng B, Shen Y, Cheung GSP, Xia TJ. Defects in ProTaper S1 instruments after clinical use: Longitudinal examination. Int Endod J 2005;38:550-57. 24. Spanaki-Voreadi AP, Kerezoudis NP, Zinelis S. Failure mechanism of Protaper Ni-Ti rotary instruments during clinical use: Fractographic analysis. Int Endod J 2006;39:171-78. 25. Cheung GSP, Peng B, Bian Z, Shen Y, Darvell BW. Defects in Protaper S1 instruments after clinical use: Fractographic examination. Int Endod J 2005;38:802-09. Sundaram, K.M. and Ebenezar, R.A.V. and Ghani, M.F. and Martina, L. and Narayanan, A. and Mony, B.